Note: The manual methods in this tutorial are great, but if you’re looking for a “set-it-and-forget-it” automated backup solution, we now offer a site backup service that can also back up your MS SQL and MySQL databases. Read more about it on our site, or activate it in Control Panel. It’s easy, it’s inexpensive and it’s cool. What more could you ask for? A lot of people seem to have a problem doing backup and restoration of a MySQL database easily and quickly. However, I am going to show you how to do just that using MySQL’s built in mysqldump.exe utility through a Windows MS-DOS prompt. There are some limitations to this utility given that Winhost customers cannot add and drop databases when trying to restore a backup, so the restore section is only recommended for new empty databases. My local environment also consisted of using MySQL version 5.5.13 so that this information would be as up to date as possible. You can find additional features, commands, and details on this tool straight from the MySQL site. First you are going to want to download the latest version of MySQL from the MySQL site. Note: If you are not sure whether to download the MSI installer file or the .zip archive I would recommend to downloading MSI package. This file provides you with everything you need including a Configuration Wizard which is not included in the No-install Archive. Use the mysqldump utility to create a backup of you database. Enter “cmd” into the dialog box and click the “OK” button. 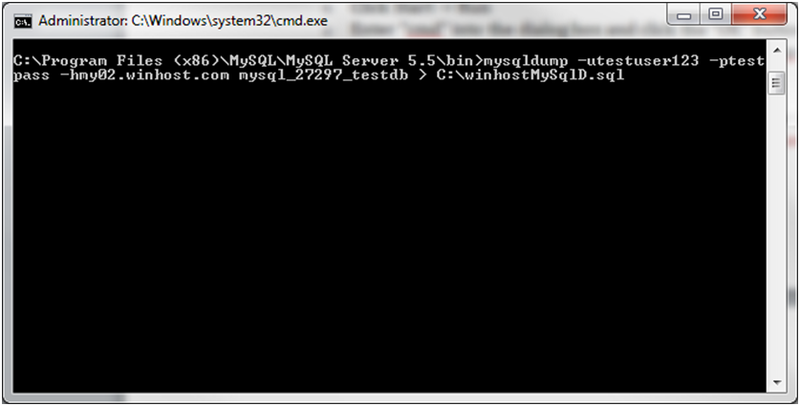 Change the directory to the following to access the mysqldump utility. Create a dump of your current mysql database or table (do not include the bracket symbols [ ] in your commands). If you supplied all the arguments properly, the program will connect to your current mysql server and create a dump of your whole database in the directory you specified in your C:\ directory. There is no message that will indicate the dump has been completed, the text cursor will simply move to the next line. Note: The following command will only write the data that is in the .sql file. This will not drop and create the database or truncate any of your other tables in your database. The command will script all the table data in the .sql file to your Winhost database. If you have a table name present in your Winhost database that matches a table name in the .sql file, the table will be overwritten with the new data. Otherwise the script will create a new table and populate it with the new data. Go to the directory that the mysql client utility is located. Import the dump of your database or table. Run the mysql.exe program using the following arguments. Thanks from the useful information. Not sure if you are still monitoring this thread. Hope you don’t mind a question from a MySQL newbie. Using MySQL on Windows, is there a way to specify the input file name when restoring using MYSQLIMPORT.EXE or MYSQL.EXE other than using < inputfile ? For example, MYSQLDUMP.EXE has the –result-file (or -r) parameter. I cannot find an equivalent input file parameter for MYSQLIMPORT.EXE or MYSQL.EXE. Or is < inputfile the only way to do that?